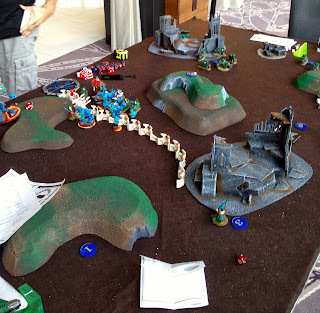 Jarid's cool looking Eldar with Tau allies and another themed Aegis! Another great looking army that scored better on paint than I did. We had both done really great our first two games so we got on to table 1. Now table 1 was in a kinda 'roped off' section out in the lobby area. Over there they were doing different streaming of various games, usually the top tables. Thankfully not for the OpentGT! At the time Frankie was playing Thomas (Goatboy) on a 'battle of the internet stars' on the Invitational table. So at that moment I'm out in a special place, having done great my first two games, looking across at a really excellent and frightening list. I was nervous as hell. I told Jarid as much. I don't know why exactly but I'm sure it was a little bit of everything. I've mentioned I'm not the greatest general but table 1 is still table 1 so you can't argue with that. So I took a couple of deep breathes and onward we went. Another truly terrible picture to show the deployment. He won to go first and set up his Aegis at the 24" mark and piled in behind it. Now having played Tau I know how scary the shooting can be, but range can be a problem. So I had a brilliant idea. "I'll reserve/outflank as much as I can so he can't kill it all turn 2 and I'll be on him." Pro tip- this is a terrible idea. I thought if I could get 2-3 of my bike squads on the outflank and a Storm Talon or two I'll outright kill his Riptide and mangle his broadsides (never mind that I was ignoring all the drone buffer he had). That turn I'll also charge my command squad forward so he'll have too many targets in his face to deal with at one time. Frankie walked over as his game was wrapping up and looked at me like I had just pooped out of my mouth. So I quickly came to the realization this was not probably the best idea. I could have actually done THE EXACT SAME THING on turn 1, or simply wait around until turn 2 if you wanted the StormTalon's to come in as well. Go figure. The good news is the 4 and a 3 were in/near my deployment, the 2 2s were in no mans land and the 1 and a 3 were in his deployment. Jarid has turn 1 and I've clearly backed myself up. He overcharges his Riptide and fails, taking a wound. He scoots his left Serp up but I think is out of range or I just make all the saves on the Command squad. He keeps his right serp back a bit, but moves his walkers up to at least get range on my Thunderfire. After all the saves I think I only took a wound on the Thunderfire. My trun 1 and I just shift some bikes around backfield. I drop the Oribital bombardment on his warwalkers but it scatters clipping only one or two so I greedily reroll with Prescience. This time it scatters back on the riptide and his drones. 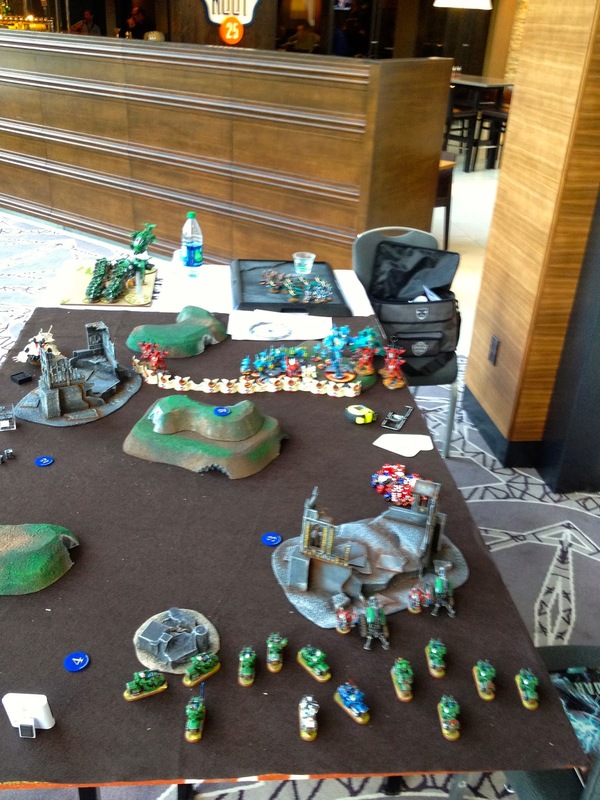 This causes 3 wounds and his riptide takes them all and fails all his saves! So he's down to 1 wound! So then I unload my Str 6 shots at the warwalkers on the right and manage to kill them all. So a nice start for me and first blood. His turn 2 and I think he gets one of his jetbikes squads and his Kroot outflank next to my bikes. They kill two bikes including one of the flamers but they hold. My Thunderfire makes saves, and I think both his serps advance to start putting shots on my Command squad but I make most (if not all) of my saves. His quad gun is the only thing that has range out of his mega Broadside/Drone/Commander/Farseer squad but even that and the Riptide don't really dent the Commander and his cohorts! My turn 2 and of all my reserves I only got the one bike squad. It comes on the riptide side and I foolishly am hungry to finish his last wound. Unfortunately he has just enough interceptor to kill the squad dead. If I had another unit or two maybe that would have worked, but alas! My Thunderfires kill of his other two warwalkers and I shoot the kroot but amazingly a small few live (I think they went to ground) and make their LD. Because they were in a long line and I killed most I fail my assault with my flamer squad. Also my snipers moved on from reserve as well looking to advance on the ruins to claim and objective later. His turn 3 and his other two bike squads arrive. They are just scooting around the back objectives now. His left Serp advances in front of the ruins and lays into the command squad, maybe doing a wound or two. His Serp on the right turbo boosts to be up near my Thunderfire. The kroot I think shoot the bikes and fail to kill anybody. His Riptide and quad gun can't shoot because they intercepted. My turn 3 and again only one of the 3 squads of bikes arrive but both Storm Talons come in as well. I basically tuck them behind the ruins on the left so his guys can't intercept them. I keep the Storm Talons out of range of the interceptor of the Broadsides but the Quad and Riptide fire enough to kill one Storm Talon. Things in these middle phases get a bit fuzzy. I think Storm Talon glanced his left Serp, and the outflanking bikes made it explode, and the Tunderfires were working on jetbikes. I think the bikes on the right killed the kroot. I think now on his turn 4 he made a tank shock on at least one of my Thunderfires and that killed the gun. His DA got out to finish of my small bikes but I think they made their saves. The other DA were shooting at my outflanking squad with a jetbike squad and killed one or two but they held. I think his wave serp cleaned out my scouts. The Broadsides, Quad, and Riptide couldn't do much. My turn 4 and both remaining bike squad come in my left, but I decide I should keep them back on my deployment to help grab objectives. The bike squad I have left on the forward position goes after his DA squad and kills them in CC but that leaves me in the open. I think my last Thunderfire and Storm Talon tries to work the last bike squad or two down but there is at least one bike left. I start inching my command squad at his line to be another target for them. I think my last tiny bike squad charges his DA in my deployment and they end up losing combat and flee off the board. My walking around Techmarine goes into CC and pops his last Wave Serp. His turn 5 and I think he didn't take the bait with the command squad and his super broadside unit fires at my bike squad that were left in the open. They are slaughtered. I think his Riptide ended up shooting at my other Thunderfire and ended up killing them knowing to reduce the threats to his lone jetbike. I beleive he is able to quad gun the Storm Talon dead as well, meaning I have 0 chance of getting to the last jetbike baring 2 more turns. His DA in my deployment I think killed the walking around Techmarine. My turn 5 and my two remaining troops move toward objectives and shoot his remaining DA in my deployment dead. I send my Command squad zooming up toward his line in case the game goes to turn 6. At this point he can't win but he can deny points. He seperates his Farseer to stand alone on the quad gun who pop a few of my troops but they hold. His Broadsides and commander actuall advance and form a wall in front of the command squad. Now his first really terrible luck comes in to play, and in actuality we did this wrong I think. He takes a dangerous terrain test for his drones hoping off the hill. Again I think most of us were thinking it was like area but they should have been open. Regardless he loses one and fails his LD and the Riptide breaks backward a bit. It still takes some snap shots and maybe kills a bike. In reality the break seemed big at the time but I'm not sure what he could have done if he hadn't. Charge the command squad? Yes please! Certainly shoot the big blast at troops, hoping to finish or break them. But with one other squad left I could have hoped on my 4 pt objective and still won. Al the same that was a silly mistake I didn't realize until much later. My turn 6 and I turbo boost the troops into circles around the objectives realizing the Riptide could still break them with a turn 7. My bikes charge his lines but of course can't get to the farseer due to the wall so I could challenge him with Khan! I challenge and his Commander refuses. I will a lot of drones to his wounds and he fails LD and I run him down. I look for turn 7 but he points out we have only 7 minutes so we call it a game and start chatting about the game. A bit later I think 'I bet we could have gotten through the turn'. He had his riptide left fleeing, farseer on the quad, and a jetbike. The jetbike isn't going to do jack! The farseer at best shoots. And the Riptide while not supposed to be breaking can rally and shoot at troops hoping to kill a squad. My turn I would send Khan at the Farseer, the Commander at the Riptide, and the remaining Command squad to shoot (if not charge) the last bike. I think we could have done it in 7 minutes. So I roll a dice and it was a 3 so the game would have ended anyway! Still it is a 22-6 Victory as I could not get that last damn jetbike or the cunning farseer. The day ends and we pack it up and chat a bit about the event and have some laughs which is always great. I think both of us did not play our best game, but in the end I had more things go right and the denial tactic worked ok if not how I intended. Using the Torrentoffire.com site I see I'm still rooted in first, and should start the day against a GK player who I chat with before heading to dinner. He turns out to not be excited to play Gravgun bikes in the morning!